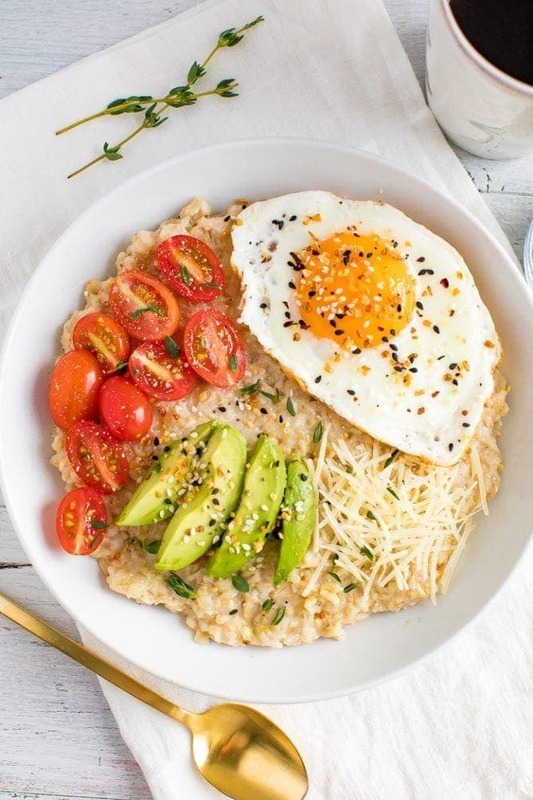 A savory oatmeal bowl with an egg, avocado, tomatoes and little parmesan. This bowl has a great combination of healthy fats, protein and carbohydrates. If you haven’t tried savory oatmeal before, you’re in for a treat. If you’ve been watching my Instagram stories, you know I’ve been obsessed with my famous egg and oat combo bowl lately. I know it kind of sounds weird, but if you like sweet and savory things you’ll love it. Don’t knock it ‘til you try it! But today I have a new, completely savory oatmeal to finish off oatmeal week. It truly hits the spot when you’re craving something savory but also don’t have ample time to whip up a full breakfast hash or frittata. 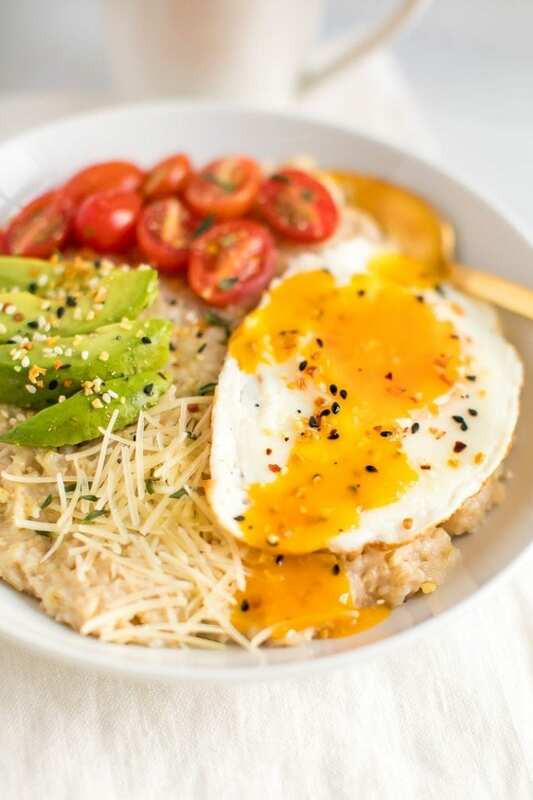 If you think it’s weird to have savory toppings on your oatmeal, think of it more like a breakfast grain bowl. Or think about oats as you would grits, which are usually served in a savory fashion. I honestly like oats more than grits because they’re creamier and they make the best, hearty, neutral base for a savory breakfast bowl. You start by making the oatmeal in a saucepan with water and a dash of salt. Again, this is your base so we’re keeping it simple and neutral in flavor! After that, you’ll prepare your egg. I prefer poached or fried . . . and a runny yolk is a must in my opinion. 😉 Then I prep all of the toppings! For this savory bowl, I just used grape tomatoes, avocado, shredded parmesan and seasoning! If you want to experiment or build on this bowl in the future, you could add some sautéed greens or roasted veggies to this too. Yum! A special note on the seasonings… I love the Everything But The Bagel Seasoning from Trader Joe’s – I even included it in my round-up of fav Trader Joe’s items! If you don’t have a Trader Joe’s near you, I’ve seen similar spice blends at Lidl and even target. I also really like adding hot sauce to my savory oats. It brings the bowl to a whole new level so I highly recommend, but if you aren’t a spice lover, you can definitely skip it. 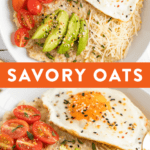 Have I convinced you to try savory oatmeal?! 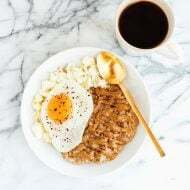 If you try this savory oatmeal recipe please leave me a comment and star rating letting me know how it turns out. Your feedback is so helpful for the EBF team and other EBF readers who are thinking about making the recipe. 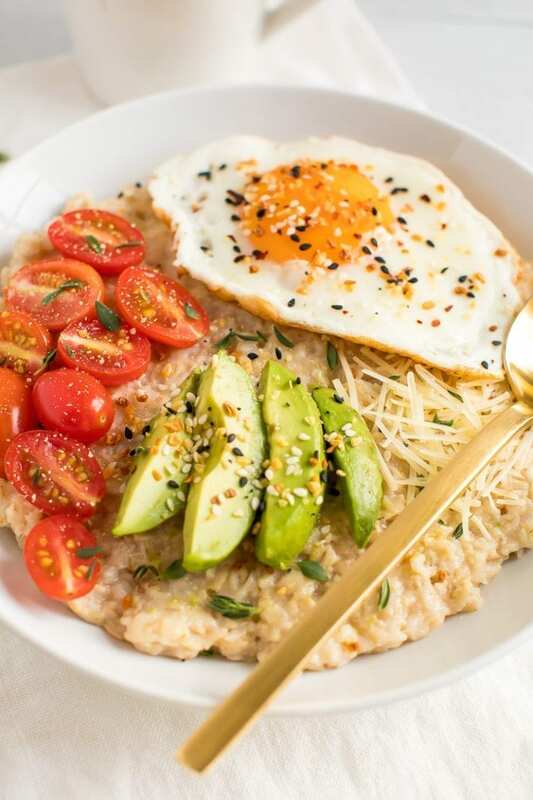 A savory oatmeal bowl that has the perfect combination of healthy fats, protein and carbohydrates. Heat water and oats in a medium saucepan over medium heat. Add a little sea salt to the oats. Cook the oats, stirring occasionally, for 5-7 minutes or until the oats are creamy and the consistency you like. Remove from heat. Meanwhile cook your egg however you like, poached or fried is my favorite. 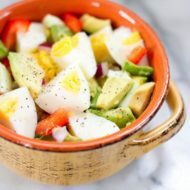 Once both the egg and oats are finished cooking grab a bowl (I like using a shallow, wide bowl) add oats and top with cooked egg, parmesan cheese, avocado, EBTB seasoning, fresh herbs and hot sauce, if using. Enjoy warm. 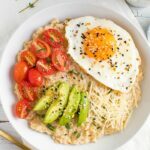 I was planning on doing my usual banana and nut butter oatmeal this morning but I think I will finally take the leap on savory oatmeal because that looks SO good! This is such an amazing breakfast bowl! I used a hard boiled egg because I was short on time, but a fried egg with a runny yolk would be even better. 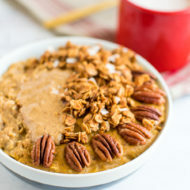 This oatmeal is just such an awesome idea!